Listen … did you hear that? The trumpeting of Asian elephants, the roar of lions and the splashes of sea lions can only mean one thing — the Saint Louis Zoo is calling! I recently answered the call and enjoyed my first visit to St. Louis’ own little slice of the wild. The Zoo has seen some big changes over the past few years, from new attractions to a transformative expansion plan. 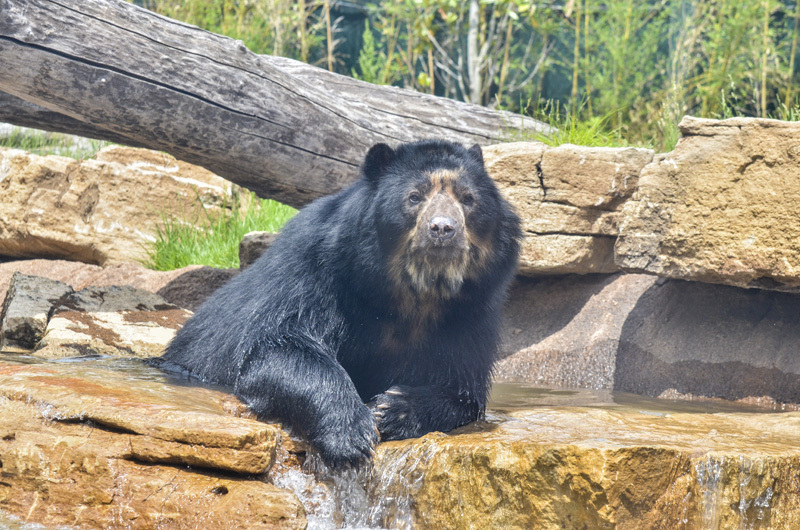 Its latest milestone, however, is the introduction of new habitats for the African painted dog, the Malayan sun bear and the Andean bear in River’s Edge. During my visit, I got a first-hand look at these three new habitats, as well as some one-on-one time with mammals and carnivores expert Zoo Curator of Carnivores Steve Bircher. Having recently moved to St. Louis from Dayton, Ohio, I had only heard about the Zoo before my visit. Friends and coworkers filled me in on some of its great features, like its innovative exhibits and large animal collection. They also told me that the Zoo is one of only three major accredited zoos in the country that does not charge admission! With these raving reviews and my tight budget in mind, the Zoo quickly moved to the top of my St. Louis bucket List. The Zoo continues to thrive because of strong leadership and the success of its many fundraising campaigns. “St. Louis corporations and individuals really support us,” Bircher explains, noting that donations played a major role in making the new River’s Edge habitats a reality. If you’ve been to the Saint Louis Zoo, you know just how unique River’s Edge is. Since opening in 2002, it’s grown to become one of the Zoo’s most noteworthy attractions. The 10-acre immersion exhibit works its way through four continents, showcasing animal and plant species from around the world. Summer 2014 River's Edge television commercial for Saint Louis Zoo. As I ventured further down the meandering River’s Edge trail, guided along by gigantic elephant footprints and the faint trickling of nearby water, civilization seemed to melt away. That sensation, as Bircher explains, is just what the space was designed to create. Zoo officials took special measures to ensure the area has an authentic feel for visitors and animals alike. The viewing features in River’s Edge allow visitors to get up close and personal with the some of the exhibit’s newest residents. Native to the Andean mountains of South America, Andean bears love to climb, lounge in the sunshine and play in the water. The Zoo kept this in mind when designing their St. Louis home, which includes grass, trees, a waterfall and a stream. You can watch these animals through large glass windows. The Purina Painted Dog Preserve is made to resemble the animals’ natural African habitat, complete with open grassy areas, sand and a flowing stream. From several large glass windows at ground level, visitors can watch the dogs chase each other and play in the water. As you near the end of River’s Edge, you’ll come across Sun Bear Forest. This tree-filled habitat is home to the world’s smallest bear species, the Malayan sun bear. The Zoo’s two bears, a male named Rimba and a female named Miskin, spend their days climbing and enjoying their waterfall and pool. When you’re viewing Rimba and Miskin, see if you can catch them sniffing around a pile of logs. Zookeepers often hide healthy treats there for the bears to find. Watching these animals enjoy their new and improved home is the perfect end to a journey through River’s Edge. River’s Edge gives visitors a sense of the multitude of species found in South America, Africa, Asia and North America. While diverse in many ways, several of these species share a common threat: extinction. The Saint Louis Zoo contributes to the survival of numerous threatened and endangered species through research, conservation and education. Now they’re calling on visitors to get involved, as well. For more information on ways you can help, visit the Conservation page on the Saint Louis Zoo website. Note: This is part of FPF's ongoing series of correspondents' reports on interesting events and exhibitions happening here in Forest Park. Previous pieces have explored Tarzan at the Muny; 250 in 250 at the Missouri History Museum; and Impressionist France at the Saint Louis Art Museum.